Midfielder Raul Mendiola scored the first hat trick in Lights’ history, but the team lost 6-4 at Oklahoma City on Wednesday. 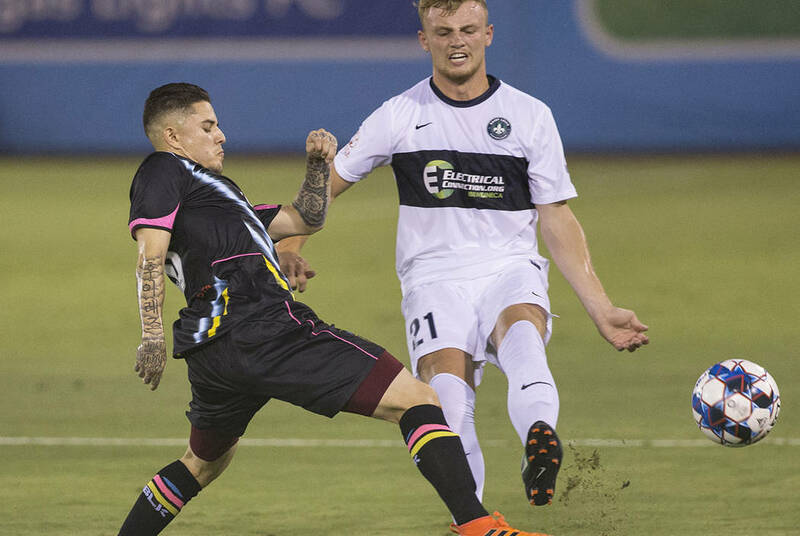 The Lights FC and OKC Energy FC put on a high-scoring spectacle Wednesday on national TV, but only one team got points out of it. After a wild second half featuring seemingly nonstop scoring, it was the Energy emerging victorious — 6-4 at Oklahoma City. The Lights’ effort mostly was forgettable, except for midfielder Raul Mendiola scoring the first hat trick in team history. The game on ESPNews also marked the second time this season that 10 goals were scored in a USL match. “We continued fighting, all 90 minutes, and we were in the game competing,” said Lights FC coach Isidro Sanchez. The loss marked the season’s midway point for the Lights (5-7-5), whose season-long four-game road trip started disappointingly. The team was in a difficult position with few reinforcements available after a home win Saturday in triple-digit temperatures, but it still allowed the Energy to weave through its defense far too regularly. Midfielder Hugh Alexander Dixon led the OKC attack with two goals and an assist, with teammates Francis Atuahene, Atiba Harris, Jaime Siaj and Christian Volesky also scoring. The Energy (6-10-3) were tied for last in the USL in goals entering the game, but the Lights made them look like an offensive juggernaut. Las Vegas had no choice but to try to match OKC goal for goal thanks to its poor defending and came up short. Carlos Alvarez picked up his fifth goal and Mendiola scored three second-half goals. The Energy scored first in the 12th minute, with Alvarez equalizing three minutes later. From there OKC took control with three straight goals, ending with Atuahene’s strike in the 57th minute that the Lights wanted waved off for a handball. “Even though we were losing 4-1, I could still see a light at the end of the tunnel. I never thought it was over,” Sanchez said. Mendiola scored twice to make the score 4-3, but Dixon scored his second and Volesky punched in another during stoppage time for the Energy. Mendiola added one more goal in stoppage time, giving him five in his last three games. The result dropped the Lights to 1-5-2 away from Cashman Field. Sanchez said before the team left that the road trip will define his team’s season. More Lights: Follow all of our Las Vegas Lights FC coverage online at reviewjournal.com/lights and @RJ_Sports on Twitter.